BenQ today launched CH100, the first portable LED projector specially designed to maximize the few key minutes of a critical presentation for web designers, graphic artists, and all visionary storytellers who never compromise when bringing ideas to life. The BenQ CH100 covers an exceptionally wide color gamut of 90% NTSC, reproduces the reliable sRGB color fidelity standard to assure that presentations accurately preserve colors the way they were meant to be seen. Its high-contrast Full HD 1080p performance generates pristine, detailed images enhanced by five picture modes – sRGB, Motion Graphics, Lectures, Vivid Color, and Cinema settings – making CH100 equally adept in a variety of presentation environments and business applications. For successful client meetings regardless of location, CH100 is equipped with short-throw capability to project large 81” images from just 2 meters away. Powered by a durable 20,000-hour LED light source, CH100 never needs lamp replacement to preserve its perfect presentation quality. The LED light source produces highly saturated colors, triggering the Helmholtz-Kohlrausch effect to boost CH100’s perceived brightness appear twice as bright as its 1,000 ANSI lumen rating, for comfortable viewing in well-lit venues accommodating as many as 10 attendees. BenQ CH100 is only the size of a 13” laptop, to easily slip into a portfolio. 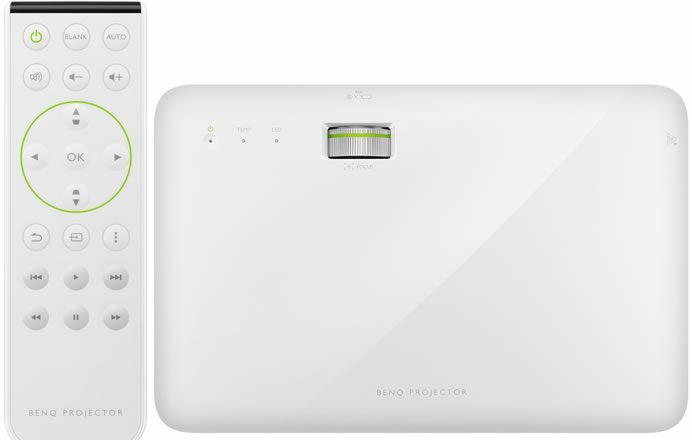 When it’s time, the LED projector turns on in mere seconds with automatic aspect ratio, keystone, and cable detection. And with virtually silent 30dBA operation, CH100 immediately engages the audience’s full attention with quick startup to make an immaculate professional statement. The optional QCast wireless Full HD 1080p streaming dongle enables untethered collaboration where the presenter and audience may walk about and interact freely.